Article first published as 3D Printer Used To Engineer New Bone Like Material on Technorati. So far printers have been used as a fax machine, printer, scanner and a xerox machine, but these are all 2D printers. Have you heard of 3D printers? These days everything happens in 3D from the latest blockbuster movies to the TV shows in your living room, so this shouldn't come as a surprise. According to various news sources, researchers from the Washington State University used a 3D inkjet printer to create a new bone-like material. And what's exciting is that this material actually does look like bone, acts like bone and feels like bone too. This new breakthrough in engineering technology promises a wide scope for treatment procedures in the field of orthopedics, dentistry, and even in the field of medicine where it can be used to deliver medicine for treating osteoporosis. When used in conjunction with surgical procedures, this bone-like material can act as a scaffold for new bone to grow on and it ultimately dissolves, with apparently no side effects whatsoever. According the Science Daily News report, the new material has already been tested in vitro successfully and the report was published in the Journal of Dental Materials where they reported seeing promising results with in vivo tests on rats and rabbits. The results of the test were very promising as after just a week in a medium with immature human bone cells, the scaffold was supporting a network of new bone cells. Earlier in 2007, a similar study was being carried out by a researcher from McGill University who also tried using a modified inkjet printer to produce three-dimensional bioceramic "bones". It took four years of dedicated hard work from a team of interdisciplinary effort that involved chemistry, material science, biology and manufacturing and a grant of $1.5 million from the National Institutes of Health, to finally succeed in producing this new bone-like material from the 3D inkjet printer, which is nothing short of a medical marvel. According to the paper, it was the addition of zinc and silicon to the main ingredient calcium phosphate that more than doubled it's strength. The research team included mechanical and materials engineering Professor Amit Bandyopadhyay, doctoral student Gary Fielding and research assistant Solaiman Tarafder. So how does this 3D printer work? The printer works by spraying a plastic binder over a bed of powder in layers of 20 microns, which is about half the width of a human hair. Thereafter, it follows the directions of a computer and creates a channeled cylinder that is the size of a pencil eraser. "It's possible that doctors will be able to custom order replacement bone tissue in a few years, said Susmita Bose, co-author and professor in WSU's School of Mechanical and Materials Engineering." "If a doctor has a CT scan of a defect, we can convert it to a CAD file and make the scaffold according to the defect," Bose said. 3D printers will be the next equipment that will surely be very useful in every office. It's good to know that the latest 3D printer makes a new bone like material. This will definitely make the job of the doctors and dentists easier and faster. In addition to that, resolution to medical and dental problem can be managed accordingly. 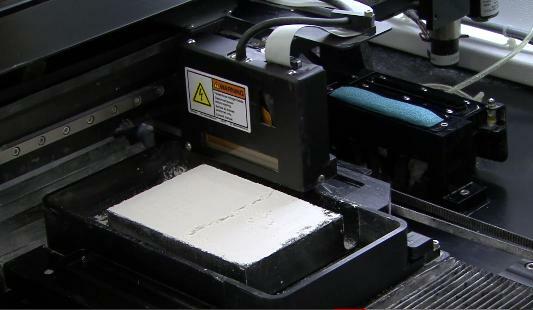 I have seen this printing technology being used by forensic science as well as 3D artists. I find it quite impressive. Thanks for the posts. Great Blog. wow great post in ur blog i really impress ur blog thanx dear share the good post..